Now my knowledge of vermouth is limited to say the least. I always associated it with the Italian red vermouth, Martini Rosso. A foul drink as I remember. A drink from a different era. A drink my parents drunk at dinner parties. I’d tasted it, but generally it was to be avoided. Maybe in the odd cocktail, but on its own, no thank you. And then I moved to Barcelona and was taken to my very first ‘vermut’ bar, Cala del Vermut, where they serve their own label, Catalan brewed, Spanish vermouth on tap. It comes in a tall straight glass, with ice and a green olive. It was fantastic. I loved it. The perfect apéritif. And at €2 it is an absolute bargain. 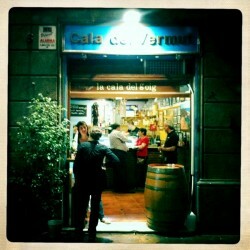 Cala del Vermut is now my favourite vermouth bar in Barcelona. Although it’s difficult to call it a bar. It’s more a hole in the wall, a garage, a lock-up. The shutter goes up and it’s open for business. No door. You step inside and you’re practically at the bar. It could probably hold 20 people at a push. The rest spill out onto the street. But what a bar! The walls are covered with stylish memorabilia from a 50s Mediterranean lifestyle. Photos of the beaches and bays of the Costa Brava in the 60s cram the walls. Retro style soda bottles at the sides to spritz up your vermouth if you wish (or just make it last longer). Various glass bottles and canned goods line the shelves above you. A gorgeous old barrel lingers in the doorway, a perfect place to stand with your vermut and tapas. On a summers evening, standing on the street at that barrel, watching the world go by while sipping on a vermut and eating what are some very fine green olives with anchovies – it really doesn’t get much better for me. Whether you’re on your way out for dinner, or on your way back from Santa Caterina market to cook up a feast at home, it really is the perfect stop off. You can also buy their own brand vermouth by the bottle to take home. A bargain at €5.50. So you can have a little piece of Cala del Vermut in the comfort of your own home. Cala del Vermut has another place up the road (c/ Copons, 2) that provides more seating and more substantial food but it is still a small place. There is also one down the road, slightly larger again. Three places within 300 metres. They like to keep it local! But this hole in the wall is my favourite. Real character. And a special charm. If you like a vermouth. Or have never tried one then I encourage you to check it out. You can find Cala del Vermut on c/ Magdalenes, 6. It’s open every day 11am-4pm and every evening except Sundays from 7pm-10.30pm. 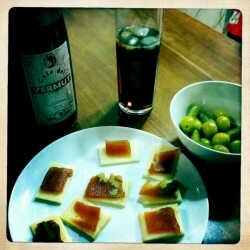 The website is at www.caladelvermut.com but is distinctly lacking. The best thing to do is just go. You wont be disappointed. I’m so glad you’ve featured Cala del Vermut. 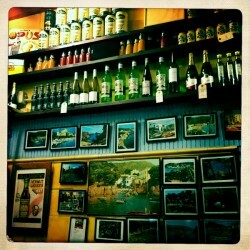 I love this place, especially those 60s and 70s Costa Brava photos. A must visit in Barcelona.